It’s Just Words … Or Is It? “Sticks and stones may break my bones, but words will never hurt me.” I grew up on the school playgrounds of small town Pennsylvania, where this childhood adage was often spoken in response to bullying or crude behavior. The truth, however, is that words did hurt. Because I loved to compete in sports with the boys rather than play dolls with the girls, I was called a “tomboy” as a child. I shrugged it off, but “tomboy” was a pejorative word that, as an adult, I can hardly believe people felt comfortable calling me. I lament whenever I hear anyone claim his or her right to verbally trash people they don’t like. It pains me to hear people criticize each other, believing that in order to promote themselves they have to bring someone else down. I would never make a good politician because I just don’t have it in me to engage in verbal warfare. I am deeply grateful that in the episcopal elections this past summer, all of the candidates honored and respected one another. “It’s just words,” we say, excusing harsh words from others. But it’s never “just words.” Words can hurt others. Words can demean others. Words can treat others as objects. “Tomboy” hurt me many years ago. My parents modeled how to be a good citizen in the polling booth. My mother and father were life-long Christians who did not always agree on politics and probably canceled out each other’s votes at times. They urged me to vote in a way that best expresses my faith and practice, seeks the common good and demonstrates grace to all people. When I am in the voting booth, I imagine Jesus standing next to me. I remember that Jesus loves all people, no matter the color of their skin, the country in which they live, how much money they earn, or the religion they practice. Jesus especially cares for those that society devalues or even rejects. He loved children and healed the sick. Jesus said that those who inherit the kingdom are compelled give food to the hungry and water to the thirsty. They welcome strangers, give clothing to the naked, and care for the earth. They tend the sick and visit those in prison. They reject racism, seek peace, and advocate for education and jobs for all. Jesus proclaims that every single life is precious and important. The challenge many of us have in engaging the political process is that we don’t really know who the candidates are in their heart of hearts. And we’re not sure whether their words accurately reflect their values and beliefs. Last week I read an article by Timothy Cahill about a lecture Parker Palmer gave at Yale Divinity School, the seminary from which I graduated. [i] Palmer, a spiritual author and lecturer who co-founded the Center for Courage and Renewal, has played an important role in my own spiritual development with his 2004 book, A Hidden Wholeness; The Journey toward an Undivided Life. In his September 23 lecture, Palmer said these words, “The soul won’t bear the inauthentic life.” In an undivided life, our inner and outer lives are the same. When we pretend to be someone we are not, the burden of inauthenticity divides our soul. But more than that, there is a deep connection between what is happening in our world today and the inner life of individuals. 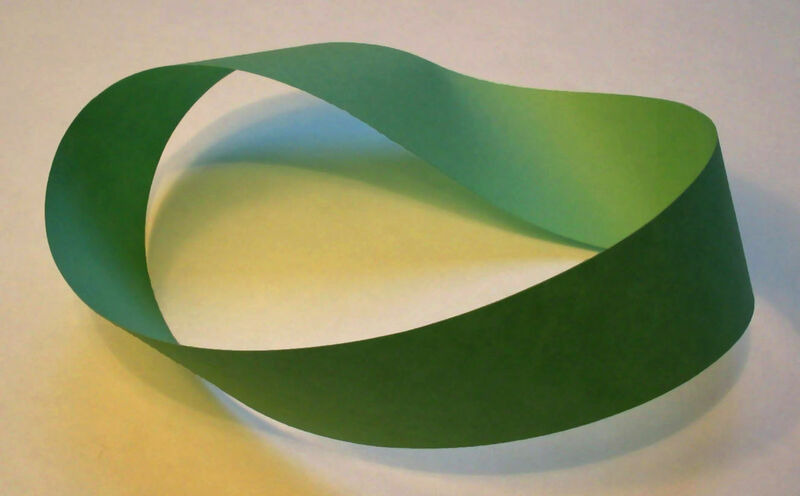 Cahill wrote, “Palmer stressed the importance of an ‘inner and outer exchange’ of self-knowledge and action, using the image of a Möbius strip, a mathematical model constructed by twisting a length of paper and joining the edge. The resulting surface has only one side – the strip merges from inside to outside and back again in continual, seamless transition. “‘That’s exactly how life works,’ Palmer said. ‘Every moment of every day, you and I are making choices of what we bring forward from ourselves.’ Whether anger or compassion, greed or generosity, fear or faith, ‘those choices shape the outer world,’ he said.” Like the Möbius strip, individuals who are self-integrated and transparent are seamless in their inner and outer lives. Their words and actions are congruent with their hearts. A great spark of hope ended the October 9 presidential debate when town-hall participant Karl Becker asked the last question, “Regardless of the current rhetoric, would either of you name one positive thing that you respect in one another?” With good-natured encouragement from the audience, Hillary Clinton answered, “I respect his children. They are incredible and able and devoted, and that says a lot about Donald. 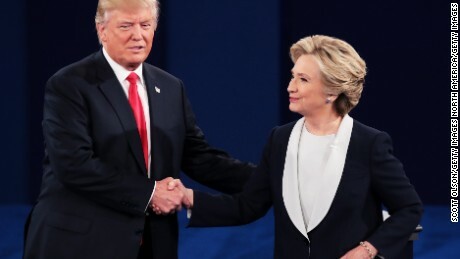 I do respect that.” Donald Trump then responded that he respects that Clinton as a “fighter” who “doesn’t give up.” He said that Clinton’s comment about his children was a “very nice compliment.” Then they shook hands. This is absolutely beautiful, and much needed. The last paragraph touched me personally. It just may become my evening prayer. As a former tomboy, maybe not so former, my mother’s advice was if I had to play baseball on my older brother’s team, at least I could let him be better. Thank you for helping restore peace. Thank you so much for your words of wisdom…words do hurt, people hurt people and just say, it was only words, it was only locker room boys talk, I was only kidding….The thought of Jesus being in the voting booth with us as the election draws nears is a wonderful thought…Words matter, may we stop and think that it is easy to be kind, to say thank you, to say good job…to remember Jesus loves all of us…and to stop and think before we utter words that can harm a heart. on target. I feel that you are still with us and that’s reassuring to me. impact on a person who doesn’t enjoy that kind of repartee. Your words have given me great comfort. 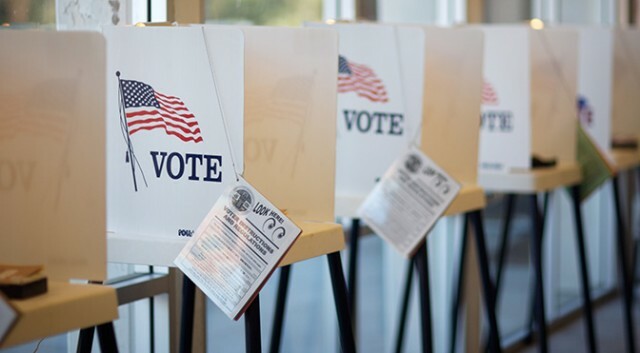 The thought of Jesus being with me in the voting booth is probably the most positive thing I can think of when I contemplate the upcoming election. Thank you. Thank you, Bishop Laurie, for the,thoughtful reminder that our words,reflect who we,are,on all levels. We are,called,as,people of faith to use them with respect and l9ve. Thank you for voicing sometimes unspoken thoughts. You help us know we are listened to, understood and loved. God’s messengers bring hope in times of grief, leadership challenges, and life. You, Parker Palmer, and the scriptures find us and lead us forward. We are blessed. I really appreciated reading your blog! This election has divided families and even good friends. There is so much negativity and fear in our social media, that it too, makes me sick to my stomach. When we find that categorizing Democrats as “evil, God haters” and Republicans as “the only hope for America”, it is hurtful (and I’m in neither party – but rather that “lukewarm” Independent also categorized into my corner.